After indulging in a variety of your favorite Thanksgiving foods your stomach might be craving something a little lighter however what about all those leftovers? These salads will help you use up your leftovers while also filling you up with greens because let’s be real as tasty as it is green bean casserole is hardly a green vegetable. If salads have you turning up your nose don’t worry there is a secret recipe at the end that will use up your leftover squash and still make you say YUMMMM. 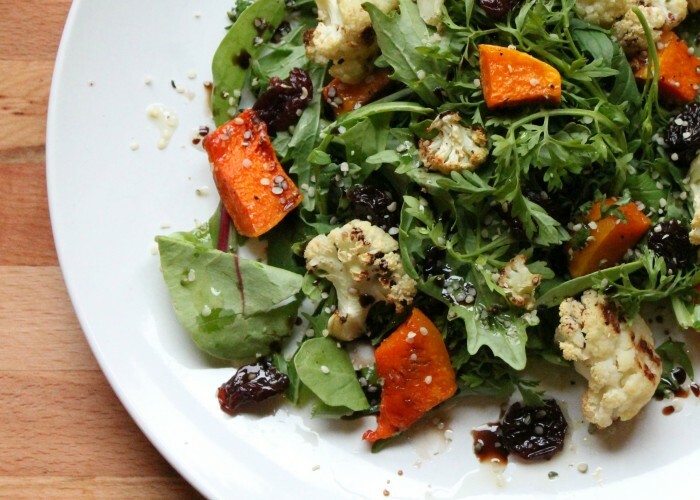 This is a super simple salad that features roasted squash and cauliflower. Feel free to sub your favorite roasted veggies such as parsnips, brussels sprouts and/or sweet potato. 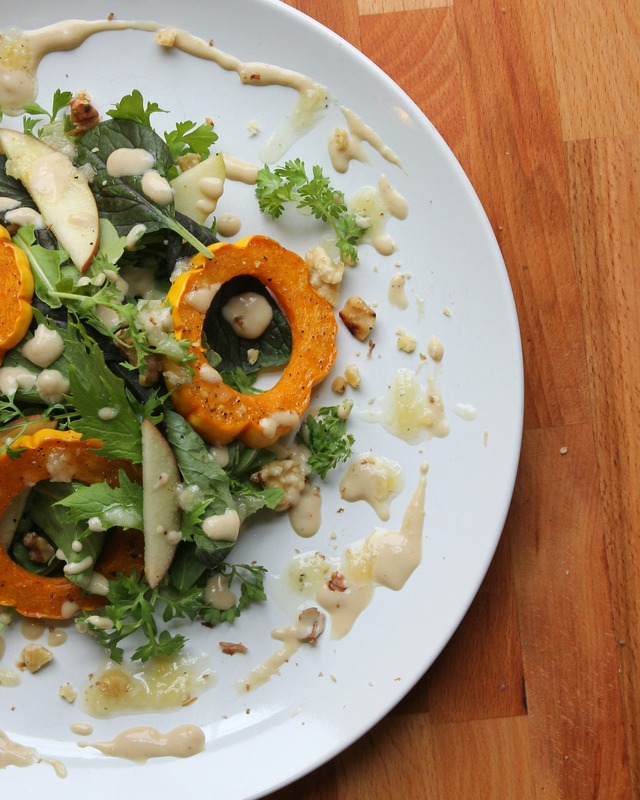 This is a super easy salad to assemble especially with leftover roasted veggies. Simply toss your roasted veggies, dried cherries and hemp seeds together and drizzle with olive oil and vinegar or lemon; alternatively one of the organicgirl Salad Love dressings would be a great addition. Pre-heat oven to 350F. Line a baking sheet with parchment paper and place the delicata squash rounds on the pan. Spray the squash with a light coating of coconut oil spray (optional) and season with salt and pepper. Place sheet pan in the oven and roast for 25-30 minutes; until the squash is cooked through. Allow to cool for 5-10 minutes on the baking sheet before adding to salad. While the squash is roasting make the tahini sauce my simply whisking everything together. Toast the walnuts in a dry pan over medium heat just until they start to get a little bit of color. Remove and allow to cool. To assemble: Divide the greens between four different plates, top with a few slices of apple and squash. 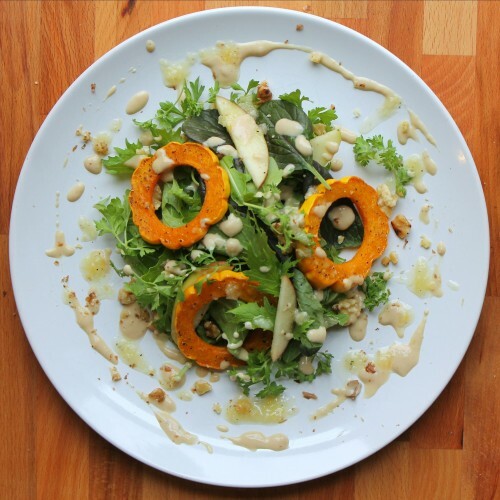 Drizzle a tablespoon each of the lemon agave dressing and the tahini sauce over the salad. Crush a few walnuts between your fingers and sprinkle over the salad. Delicata squash skin is super tender so there is no need to remove it just give it a good wash.
Feel free to serve this salad family style by placing the greens in a large bowl, top with apples, squash and walnuts and dress just before serving. Toss the apple slices with a bit of lemon juice to prevent browning. Not into these salads but have a bunch of leftover squash (I mean who really wants to eat the squash?) I have this delicious and creamy pasta recipe for you. I used butternut squash but feel free to use whatever you have. 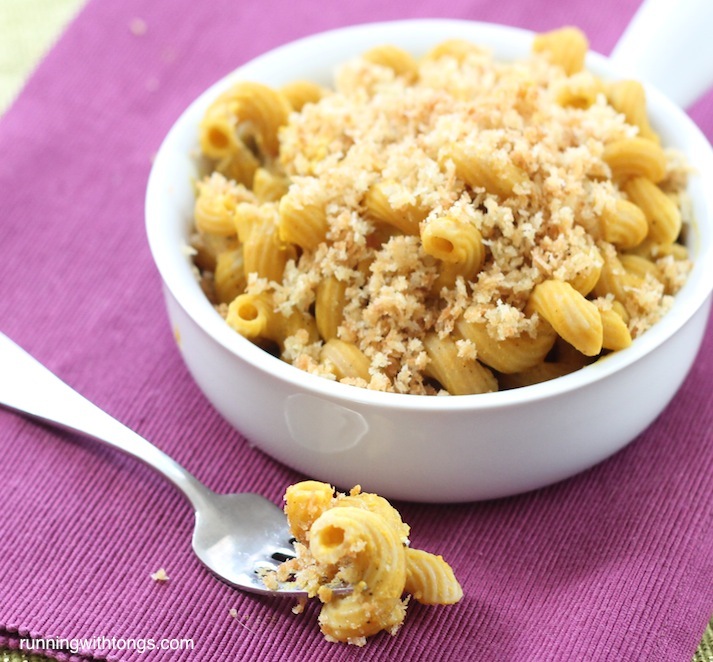 This would also be great with leftover carrots, sweet potato or cauliflower. Great recipe ! thanks for sharing us.